BlogHome » Blog » Wrong Image Sharing to Facebook? 1.Wrong Image Sharing to Facebook? Unlike our other services, Facebook does not use data sent by us and there is a link to share to determine the posting content. Instead, Facebook’s server requests a copy of your page and find the Open Graph tags set to display the information you have set. OpenGraph tags are special meta tags developed by Facebook that provide you much flexibility in displaying your content on a person’s Facebook timeline. If your shares to Facebook aren’t showing the correct information your best bet is to submit the URL that’s not being shared correctly to Facebook’s URL Debugger. This tool will let you know what data Facebook has about your URL and will highlight any errors. Facebook not being able to access your page because your site is down or behind a firewall. This will prevent your page from being shared on Facebook at all. Missing, incomplete, or invalid Open Graph tags which will be highlighted in yellow. Facebook will use other tags on the page, such as the <link rel=“canonical”> tag and the <title> tag, along with other <meta> tags and <img> tags to attempt to infer the content that should be shared. Other useful items on this page are Facebook’s Graph API URL for your page, which gives you access to the content that will be shared in a JSON document and a link to see exactly what Facebook sees when they scrape your page. This is helpful for figuring out if Facebook’s scraper bot isn’t able to access your page. The next step is putting Open Graph tags on your page. Facebook makes a very nice tool for this on their Facebook Like button page. This will generate your Open Graph tags for you to paste into the head section of your HTML document. 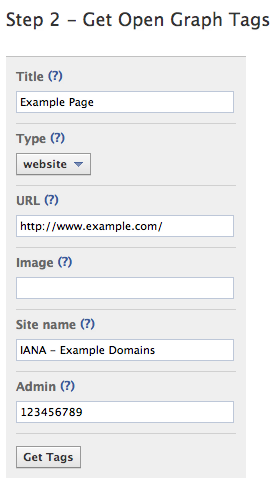 For adding Open Graph tags to your WordPress blog we recommend the Facebook Revised Open Graph Meta Tag plugin. If you’ve got a great plugin for Magento, Joomla, Drupal, or another content management system let us know about it in the comments. Other services we support, most notably LinkedIn, also use your sites meta tag information to determine what content is shared, so that’s the first thing you should check when you’re not seeing what you expect when sharing to a specific service.